Gordon Auger won’t be seeking another term as chief this October and after leading the Bigstone Cree Nation in Alberta for 20 of the last 25 or so years, he figures he’s entitled to some financial compensation over and above his salary and expenses. In two separate meetings in September, council passed resolutions to use $1.6 million from the $34 million profit recorded by the newest band company Mistassini Aboriginal Contractors Ltd. The money establishes a new retirement fund for elected officials. It finances a pre-existing transition allowance for elected officials who fail to get re-elected, and it will pay a bonus of $60,000 to the chief and $60,000 to each of 10 councillors. “I brought in over $3 billion of business and infrastructure and service to this nation as chief. To me that’s peanuts for what I’m asking for, but I’m not going for greed. I just want something to appreciate the fact of what I did,” said Auger. He says it’s natural for him and council to take their cut from MACL’s profits as he was instrumental in setting up the business and making it successful. MACL was incorporated in 2015 and started operating in 2017. Auger said that “not a penny from the band funds, trust funds or any other funds, not a penny from chief and council” went into setting up the company. “I negotiated a big contract with a big transmission line coming to our territory,” said Auger. The contract is for three years. He also hired Doug Cardinal, a “very top notch person” to run the company. Up until this point, Auger claims, money from trust funds had been bailing out band-owned companies. Now that MACL is “record-setting” successful—although there has been no publicized financial statement to back up this claim—chief and council have money to work with, he says. A policy will be put in place to recognize elected officials. The details have not yet been worked out, but Auger says chiefs and councillors, who are retiring after having served either a minimum of two or three terms, will be eligible to receive 20 per cent of their salary for three years. Retiring elected officials have to give notice of intent to retire three months prior to the election date. Councillors seeking re-election and losing are not eligible for this money. For Auger, whose salary as chief is $97,000, he will earn close to $20,000 for each of three years. He says the retirement fund is a new venture because nobody has retired from politics on the First Nation before. He also notes that government employees get pensions, but this was the best BCN could do for its band officials. “The retirement fund has to be self-generated somehow without using public funds,” said Auger. A previously established transition allowance of $70,000 contributes money to unsuccessful incumbents. Auger isn’t clear on the details of this fund, saying it was set up in the one term he didn’t serve as chief. Now that MACL has been profitable, money for the transition fund will be taken from there. “I said we deserve a goddamn good bonus,” Auger said and that bonus came in $60,000 cheques dated Sept. 13 and co-signed by Art Bigstone, a band councillor and president of MACL as well. Bigstone would not comment on accepting the bonus. According to Facebook postings and texts, two councillors refused the bonus cheques and one councillor, Gloria Anderson, who represents Calling Lake, donated the money to her community’s Head Start Program. 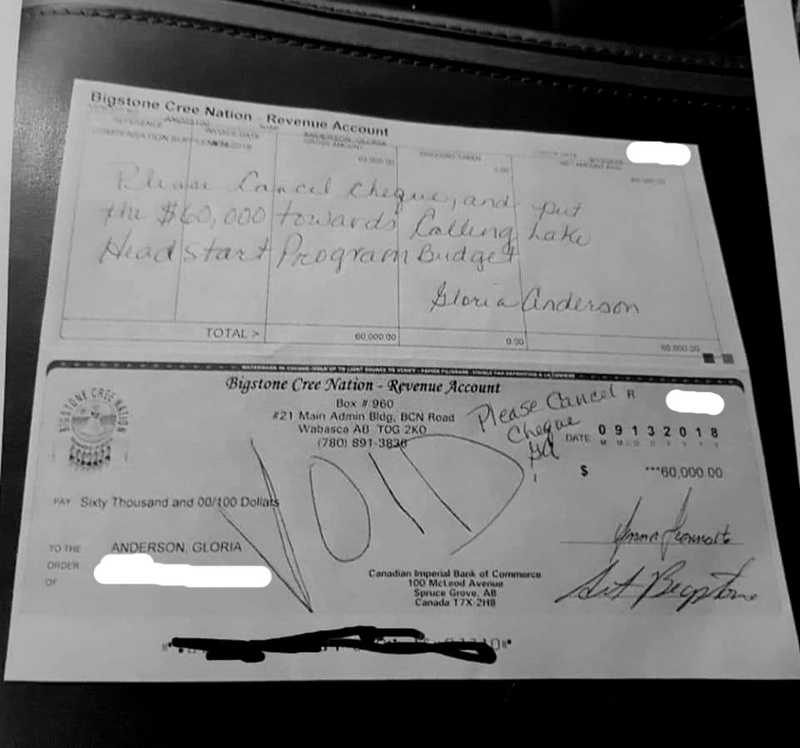 On Sept. 27, Dr. Josie C. Auger, a member of council for Bigstone Cree Nation, emailed Windspeaker.com telling us she did not take the $60,000 bonus. Auger would not comment on why councillors turned down their bonus cheques. Membership has been getting information on these band council developments through social media sites. Milburn Auger is one member who received his information on social media. The biggest issue for him is that chief and council didn’t inform membership of the “secret pop-up companies” they formed. MACL is just one, he says, and there is another with an address in Edmonton. MACL is not listed as one of the business entities on BCN’s website. His other concerns include lack of membership approval before chief and council voted on their bonuses, band meetings not being well publicized, minutes being hard to obtain, members not feeling welcomed to attend meetings, and the abandonment by chief and council of the 60 per cent of members who live off-reserve. “This is just the tip of what’s going on for the last 10 years,” said Milburn Auger, who operates White Owl Tattoo out of Slave Lave and says he has been approached to run for council. “People in the community right now, they’re voicing concerns because they all want to lay criminal charges because this is a white collar crime now,” he alleges of the bonus money. He adds that he knows there have been “more than two members” who have made complaints with the local RCMP detachment. Sgt. Mark Polzer, of the Desmarais RCMP detachment which serves BCN, would not confirm they had received complaints and said he would only make it public if charges were laid. Wayne Garnons-Williams is not surprised the community is upset about what is going on and the president of the International Inter-Tribal Trade and Investment Organization says another concern has to be how outside companies will view investing in on-reserve development. “No business in their right mind would want to partner with this organization at this present time because … there is a high level of risk which most businesses would not want to take,” he said. Garnons-Williams encourages bands to operate their businesses at arms-length for this very reason. Chief Auger points out that $6.5 million from MACL’s profit will be used on the reserve to invest in, among other things, apartments and new trailers, a staff retirement subsidy ($150,000) and Head Start. “I built this Bigstone. I call it Gordon’s World. Bigstone had nothing when I came to Wabasca,” he said. Deadline to file nomination for a seat on council is Oct. 15, with the election to take place Oct. 29.